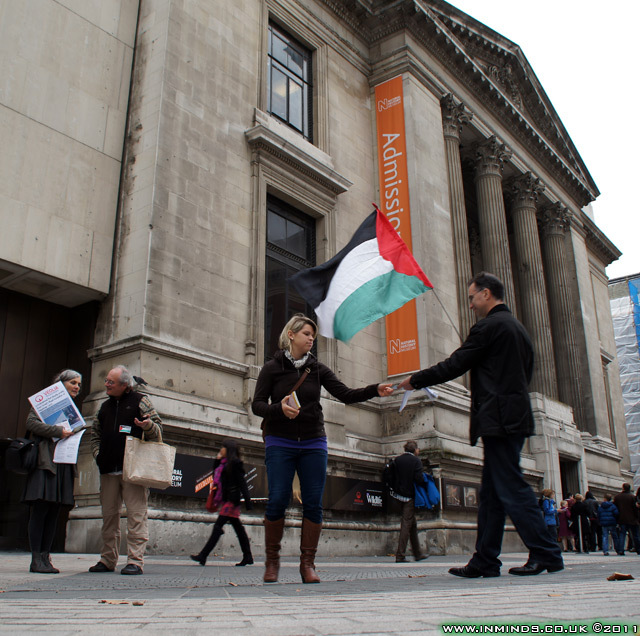 On 5th November 2011, for a second fortnight running, human rights activists from London BDS and several other groups demonstrated outside the Natural History Museum (NMH) in London to protest against the french multinational Veolia's sponsorship of the Wildlife Photographer of the Year Exhibition at the Natural History Museum. 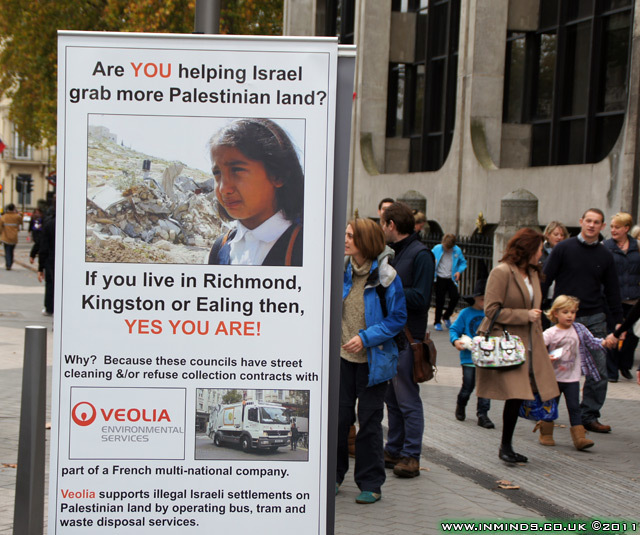 Veolia is complicit in Israel's occupation of the West Bank by providing vital services to the illegal Israeli settlements without which they couldn't function. 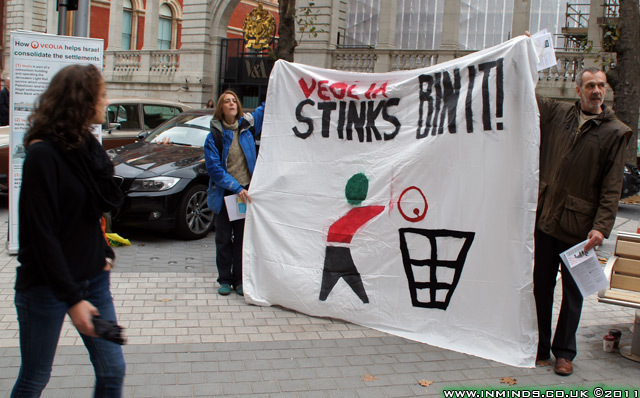 These include provides rubbish collection services to many settlements and running the Tovlan landfill site in the Occupied Jordan Valley where toxic waste from Israel and the settlements is dumped (recently Veolia has compounded its crime by selling the Tovlan site to a settlement whilst staying on in an advisory role). 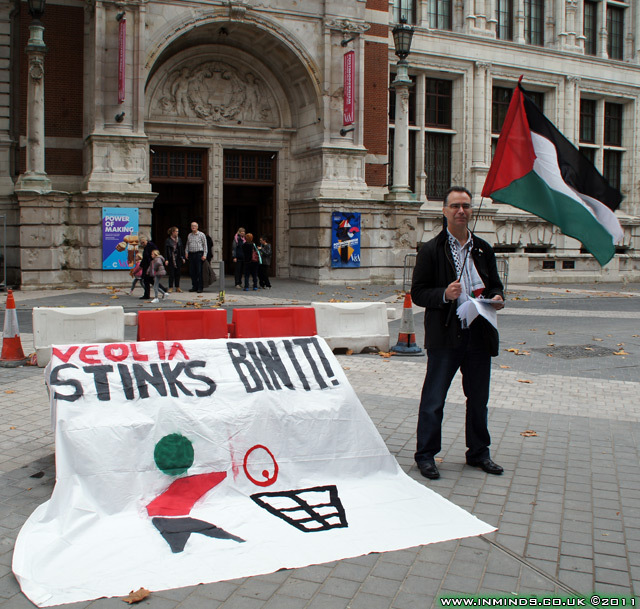 Veolia also provides bus services and a tram service between the illegal Israeli settlements in the West Bank and Israel thereby helping Israel consolidate its occupation of Palestinian land. 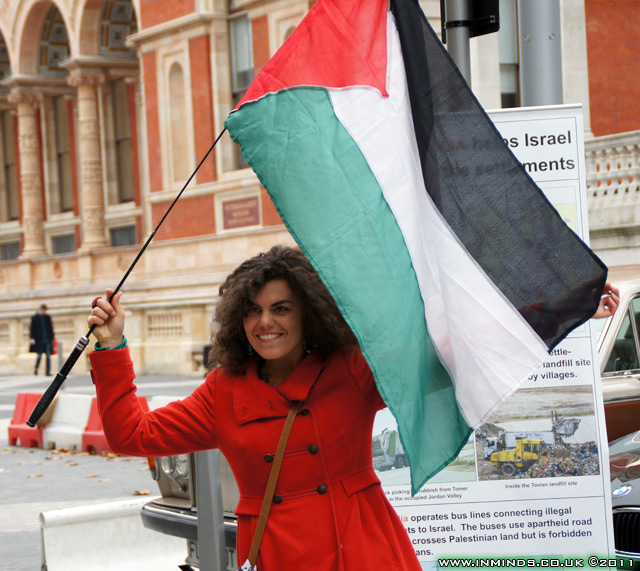 Outside the NHM's Exhibition Road entrance..
A tourist asks if she can hold the Palestinian flag for a photo - in Nelson Mandela's words Palestine is "the greatest moral issue of our time"
By following the route of the Jerusalem Light Railway, built and operated by Veolia, we can better understand the Israeli occupation and Veolia's role in that. 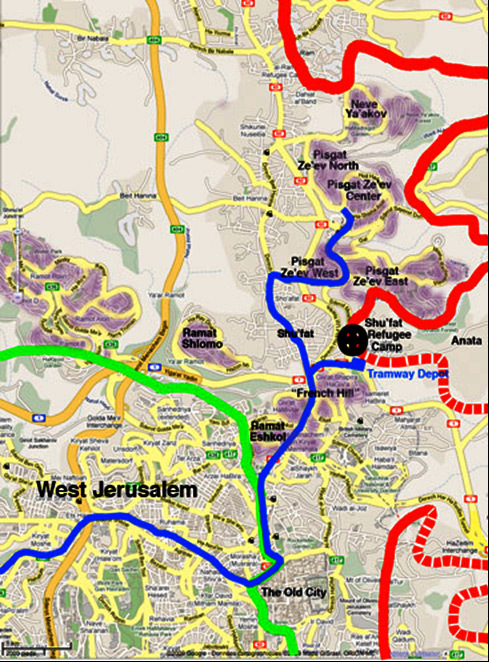 The route of the Jerusalem Light Rail (blue line left-to-right) starts in West Jerusalem (occupied by Israel in 1948) and then crosses the green line in to confiscated Palestinian land (East Jerusalem, occupied by Israel in 1967), linking illegal 'Jews only' Israeli settlements such as Ramat Eshkol, French Hill and Pisgat Ze'ev to West Jerusalem thereby helping annex more Palestinian land to Israel. Pisgat Ze'ev, in Hebrew meaning Ze'ev's Peak, is named in honour of the early racist Zionist leader Ze'ev Jabotinsky who in the 1920s, before the creation of Israel, proposed the 'Iron Wall' (of "Jewish bayonets") doctrine that "If you wish to colonize a land in which people are already living, you must provide a garrison for the land, or find a benefactor who will maintain the garrison on your behalf. 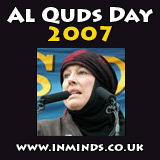 ... Zionism is a colonizing adventure and, therefore, it stands or falls on the question of armed forces." Pisgat Ze'ev, an illegal colony of 50,000 settlers established in the 1980s on stolen land cleansed of its Palestinian population at the point of "Jewish boyonets", is a fitting legacy for Jabotinsky. Illegal Jewish colony of Pisgat Ze'ev built in 1982 on the stolen land of Palestinian villages of Beit Hanina and Hizma. 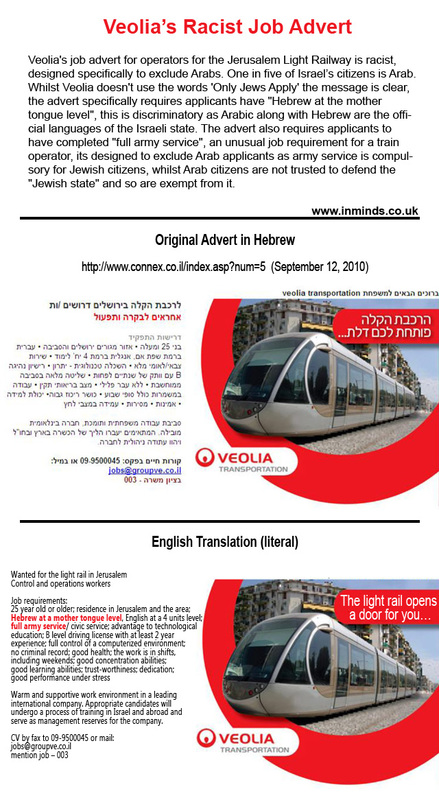 Now that the construction of the tramline has finished and is fully operational (Sept 2011) it has been revealed in the Israeli newspaper Maariv (7 Nov 2011 *) that the Jerusalem municipality has prepared a document showing plans to build 60,718 new housing units in the city during the next 20 years, including 53,000 illegal settler housing units to be constructed in East Jerusalem. The data contained in the document indicates that the area marked for construction is located in the northeastern neighbourhoods of Jerusalem closely following the tramline, from the Arab neighbourhoods of Shuafat and Beit Hanina, and on to the colony of Pisgat Ze’ev and Neve Yaakov. The tramline currently terminates at Pisgat Ze’ev but as the map shows Neve Yaakov would be the next stop in any future expansion of the line. 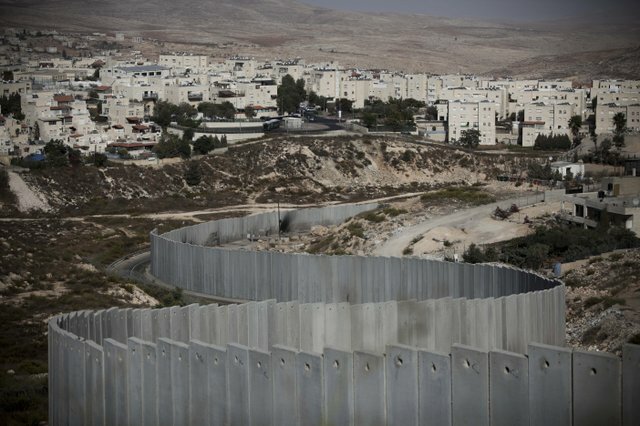 As with the conquest of America in the 19th century, where the railway played a crucial role in encouraging settlers to come and colonise indigenous people lands, so too the Jerusalem Light Rail is an instrument for colonisation of Palestinian land. 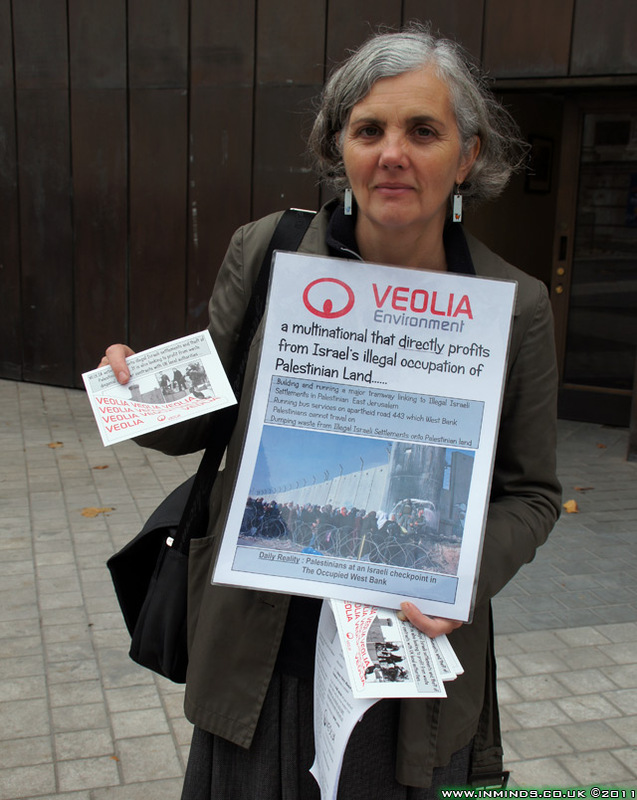 It is perhaps in this context that the magnitude of Veolia's criminality in facilitating the theft of Palestinian land can best be understood. 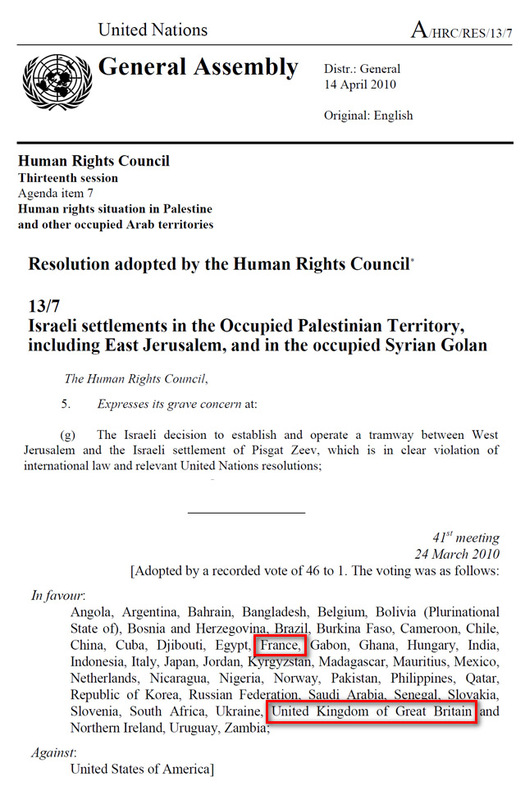 It is then not surprising that the United Nations Human Rights Council in April 2010 declared the tramway is in "clear violation of International Law and relevant United Nations resolutions" (see below). The resolution was passed 46 to 1, with the UK, France and all the EU members of the Council voting in favour. 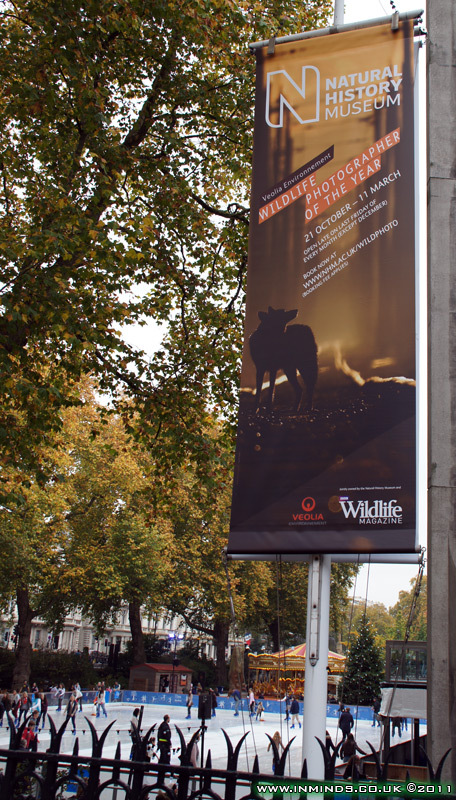 This is the third year running that, despite protests each year, and in full knowledge of Veolia's crimes, the Natural History Museum has once again chosen Veolia as the sponsor for this prestigious Wildlife Photography competition and exhibition. For Veolia its clearly an exercise in greenwashing, to spend a little money sponsoring an event which is perceived to be 'green' friendly. 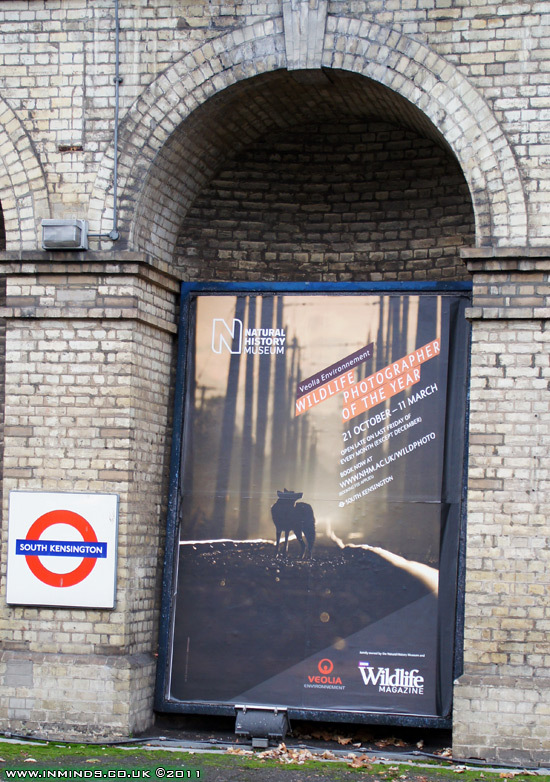 An exhibition showing us a glimpse of the beauty of nature.. yet all plastered with Veolia sponsorship logos in the hope that some of that 'green' will rub off on the company image that the public goes home with. 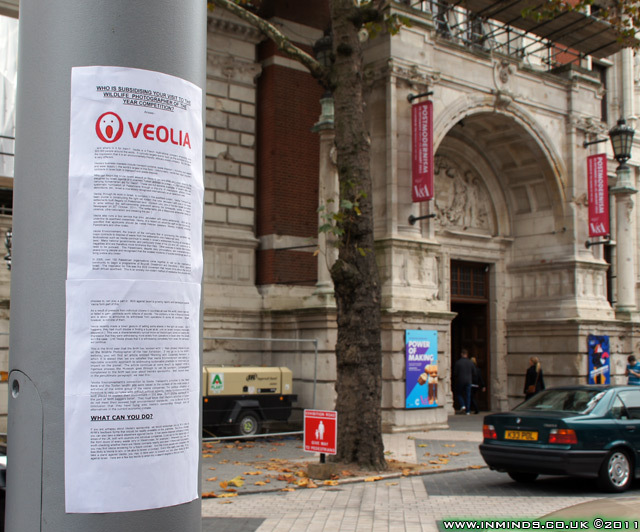 Or as Veolia's own literature not so subtly admits their sponsorship is to show the public "our commitment to both the environment and biodiversity, and demonstrates our willingness to support sustainable development across the planet. 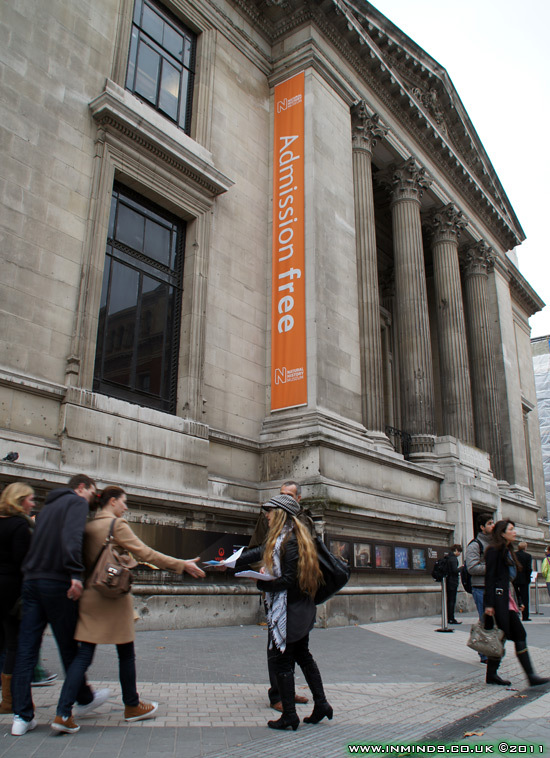 It also embodies our corporate values, including the preservation of natural resources and the very real need to inspire and educate people of all ages.."
Corporate partnerships are a critical part of the funding mix for cultural organisations and audiences, especially in these financially difficult times. The Government is keen to see publicly-funded organizations such as ourselves increase their financial self-reliance. 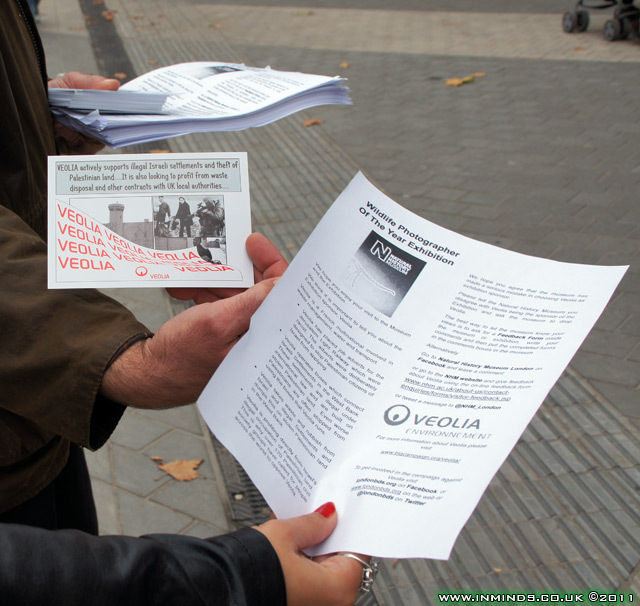 Partnering with Veolia Environnement.. helps us to do just that.. When it first becomes clear a relationship could develop.. our fundraising research team conducts a comprehensive review of each potential partner, from a wide range of independent third party sources. An evaluation panel of senior staff examine the report to inform their decision about the suitability of the sponsorship. Every organisation we work in this way with goes through the same rigorous procedure. 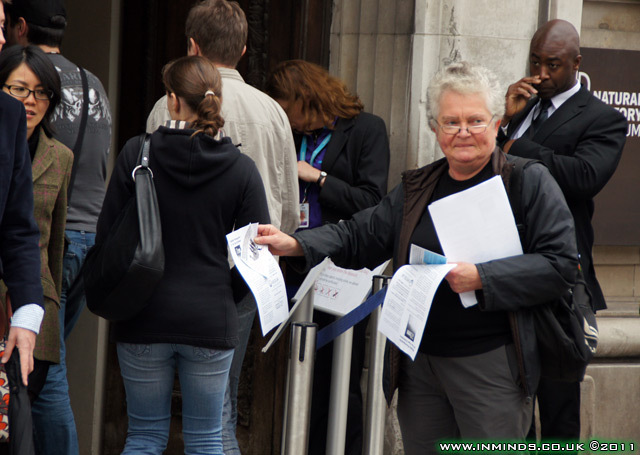 The process we follow is in line with published guidelines from many similar organisations. 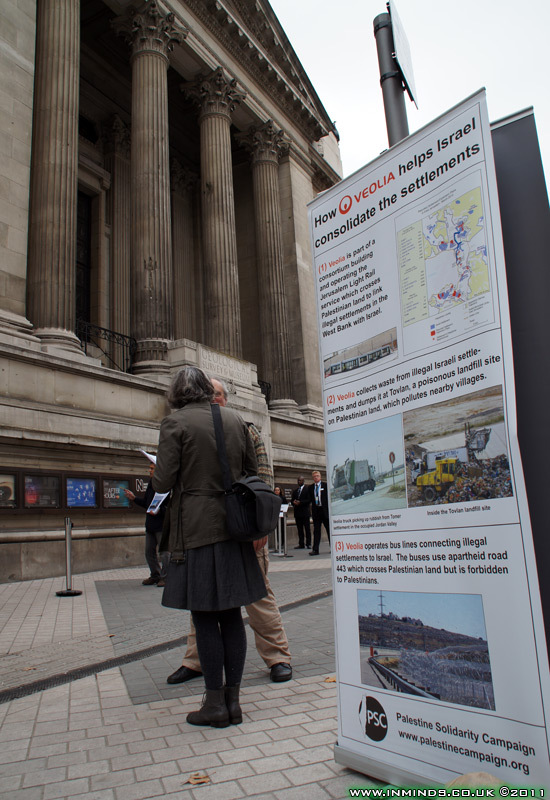 Veolia Environnement’s connection to Veolia Transport’s activities in the West Bank and the Tovlan landfill site were raised in the context of the wide range of activities of the entire group of the Veolia companies. The political situation in Palestine is very complex with difficult political aspects; Veolia Environnement are best placed to explain their involvement in the area. 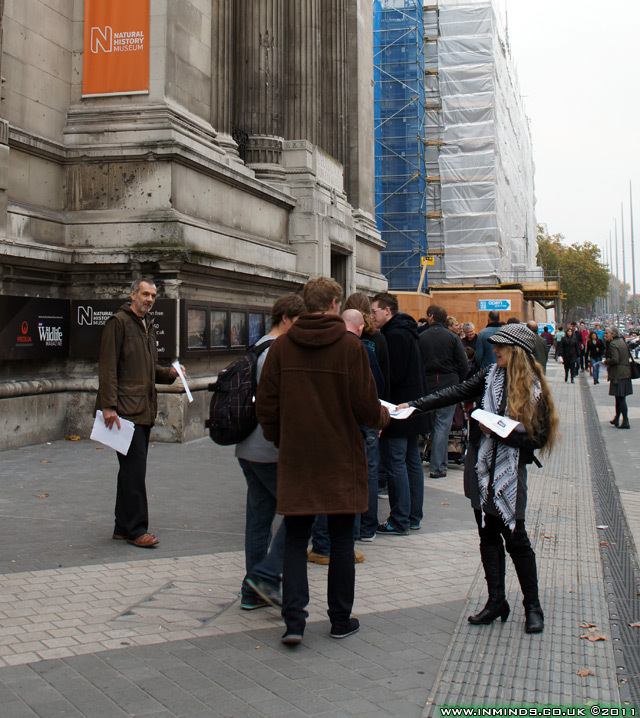 The Museum’s role is to be the voice of authority on the natural world. We don’t campaign or lobby for ourselves, any other organisation or cause beyond our core mission: to maintain and develop our collections to promote the discovery, understanding, responsible use and enjoyment of the natural world. 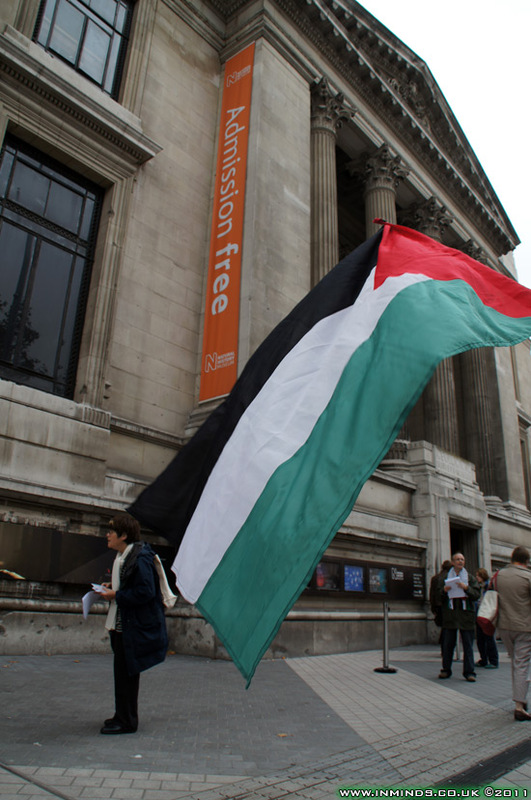 Its interesting that they say that all that matters to them is "to promote the discovery, understanding, responsible use and enjoyment of the natural world", so the problem is that the Palestinians are people, human beings, not animals so aren't classified as part of 'the natural world' and hence aren't worthy of the Natural History Museum's consideration. I guess it doesn't make a difference that former US President Jimmy Carter after visiting Gaza described the Palestinians as being "treated more like animals than human beings" (Jun 2009), or that the Palestinians tormentors like Israeli Chief of Staff Rafael Eytan described the Palestinians as "cockroaches in a glass jar" or that Israeli Prime Minister Menachem Begin referred to the Palestinians as "beasts walking on two legs" - they are still people and so aren't worthy of the Natural History Museum's consideration. 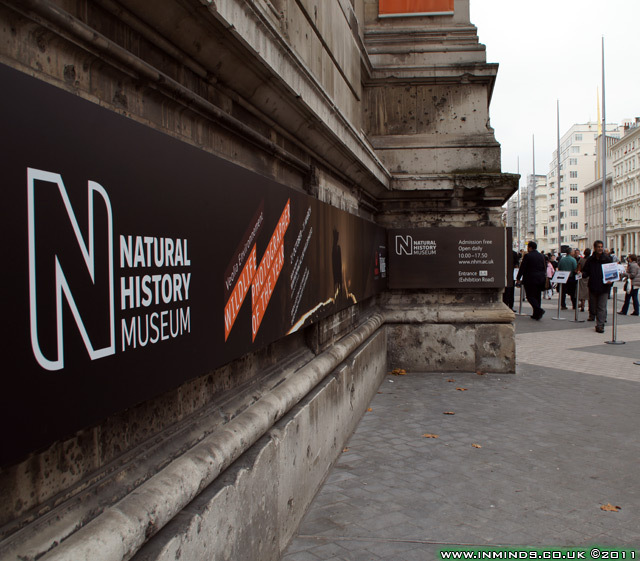 The Natural History Museum has a history of not caring where the money comes from. 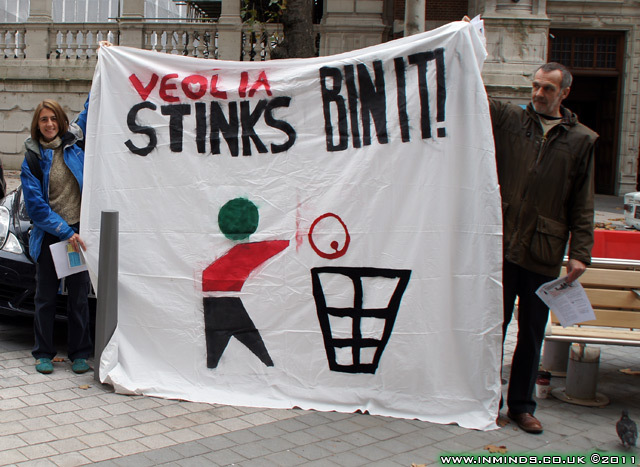 Before the Veolia sponsorship, they had partnered with Shell Oil for a two year sponsorship contract. A determined protest sustained for two years, followed the Wildlife Photographer of the Year Exhibition as it toured the country. 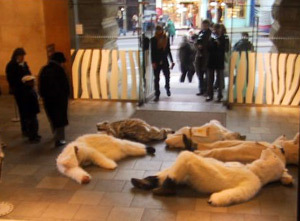 Particularly creative media grabbing protests such as a polar bear die in at Bristol Museum neutralised any 'greenwashing' and finally resulted in the sponsorship not being renewed after the two year contract finished. 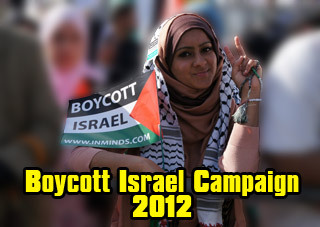 The lessons learnt from that successful campaign will no doubt feed in to this one. 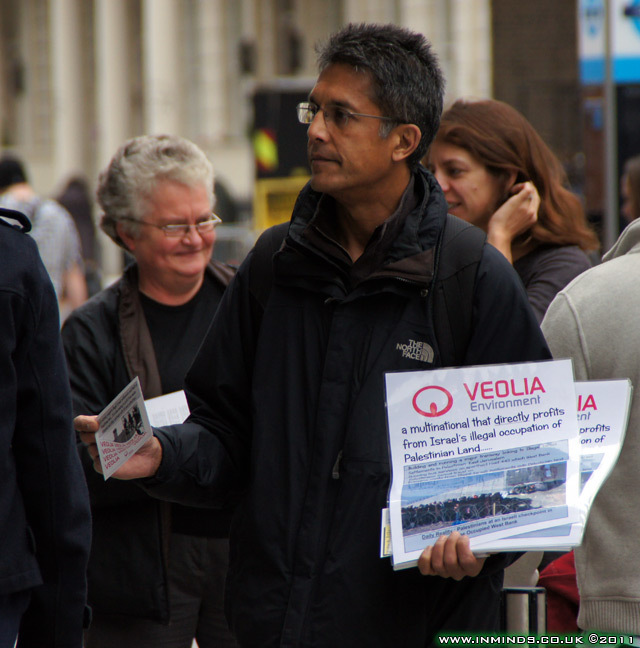 The protest will continue outside the Natural History Museum until the Veolia sponsored exhibition finishes in March 2012, after that the protest will follow the exhibition as it tours the UK. 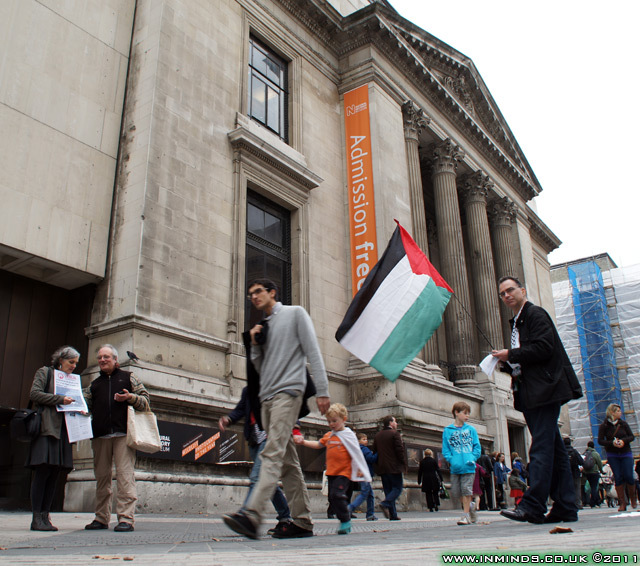 Join us at the next demonstration outside the Natural History Museum (Exhibition Road entrance) on the 19th of November 2011 (closest tube is South Kensington).